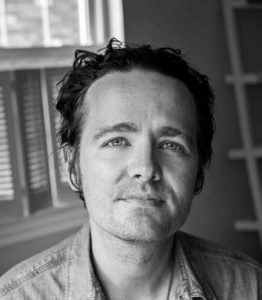 RYAN RIDGE is the author of four chapbooks as well as four full-lengths, including the hybrid novel, American Homes (University of Michigan Press, 2015). His next story collection, New Bad News, is forthcoming from Sarabande Books in 2020. Past work has appeared in American Book Review, The Collagist, DIAGRAM, Los Angeles Review, Lumina, Passages North, Salt Hill, Santa Monica Review, and elsewhere. In 2016, he received the Italo Calvino Prize in Fabulist Fiction judged by Jonathan Lethem. An assistant professor at Weber State University in Ogden, Utah, he co-directs the Creative Writing Program. In addition to his work as a writer and teacher, he edits the literary magazine, Juked. He lives in Salt Lake City with the writer Ashley Farmer.